I’m a food magazine junkie, always on the lookout for the latest issues of my favourites, or the arrival of brand new publications. A quick perusal of the magazine shelves at a Kitchener grocery store tonight rewarded me with a newbie – The County Grapevine. This newcomer focuses on the food, wine, art and culture of Prince Edward County (PEC) in southern Ontario. It seems I’m a little late getting to the party on this one; the issue I picked up is for Fall/Winter 2009/2010 (it’s a biannual publication). The magazine has been around for a while. How did I miss it?? So where exactly is Prince Edward County? PEC is an island at the eastern end of Lake Ontario. It is surrounded on the north and east by the Bay of Quinte, and is west of the St. Lawrence River. Its mild climate (by Canadian standards, that is!) has made it home to numerous vineyards and wineries. What initially attracted me to The County Grapevine as I leafed through it in the store was the article Steeped in Tradition by tea expert Melody Wren. As a tea lover always looking for new places to enjoy a good cuppa’, I was interested to read her review of tea rooms in PEC. Since bringing the magazine home, I’ve read and enjoyed a couple light-hearted pieces – “I was a teenage waitress” by comedian Deborah Kimmett and “Table Manners: The Lost Art of Dinner Parties” by sommelier Natalie MacLean. I also noticed that food stylist and blogger Ruth Gangbar was credited for food styling in the magazine. Tomorrow I’ll have to take some time to savour the food and wine articles! 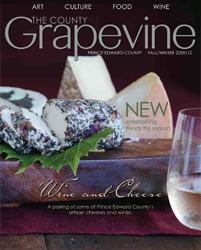 The County Grapevine is available free in Prince Edward County and surrounding areas and can be purchased at Chapters, Indigo, Metro, and stores within the Loblaws chain. I’ll drink to that – with a little help from the Wine and Food Matcher! If you’re like me and often wonder which type of wine to serve with a particular food, I’ve found a helpful tool for us to make this decision a whole lot more easily! Wine sommelier and writer Natalie MacLean has created a Wine and Food Matcher that will help us choose the most complementary wine and food pairings. The Matcher is on her website, Nat Decants. It’s fun to use and there is quite an extensive range of wines and foods included. Use it to find an eggstra-special pairing for your Easter menu this weekend. Natalie’s website has lots of other interesting information about wine as well as recipes.